Skin problems and diseases are pretty common in dogs, ranging from a bug bite to a skin infection. The symptoms are easily recognizable: itching, licking, scratching, and overall discomfort expressed by your dog. If after inspecting the skin you find an irritated patch, or if it is red, scaly, or flaking, it’s a good time to see the vet. Some skin irritation can be caused by allergic reactions, including flea reactions, but other skin conditions include yeast infections, folliculitis, impetigo, dandruff, mange, ringworm, dermatitis, pruritus, alopecia, pyoderma and more. Your vet can help you treat most any of the following conditions. Allergies – Allergies can affect the skin by causing itching and rashes called allergic dermatitis, and can be attributed to sensitivity to fleas, environment, and/or food. Environmental allergies can cause skin reactions through touch or inhalation and may require shots to control. Food allergies can be harder to pin down, but can typically be managed through a change in diet. Fleas and Ticks – Fleas are an obvious problem for your dog’s skin. They are itchy, annoying, and at their worst, cause blood loss, anemia, and exposure to other parasites. Ticks are easily spotted, cause blood loss and anemia, but they are known to transmit more serious diseases. Folliculitis – An infection that causes little bumps or scabs on your dog’s skin, folliculitis usually occurs in tandem with other infections or conditions, like mange or allergies. Special shampoo may be necessary to gently treat. Hair Loss – Hair loss in dogs is caused by a variety of problems, from parasites to thyroid disease to Cushing’s disease, an adrenal disorder. If your dog is losing his or her hair, it’s best to go to the vet, and that includes missing patches or an unusual amount of shedding. Impetigo – Impetigo is another type of bacterial infection and is most common in puppies. It manifests as blisters that tend to scab, sometimes most visible on the abdomen. Luckily, it is extremely receptive to treatment and is rarely serious! 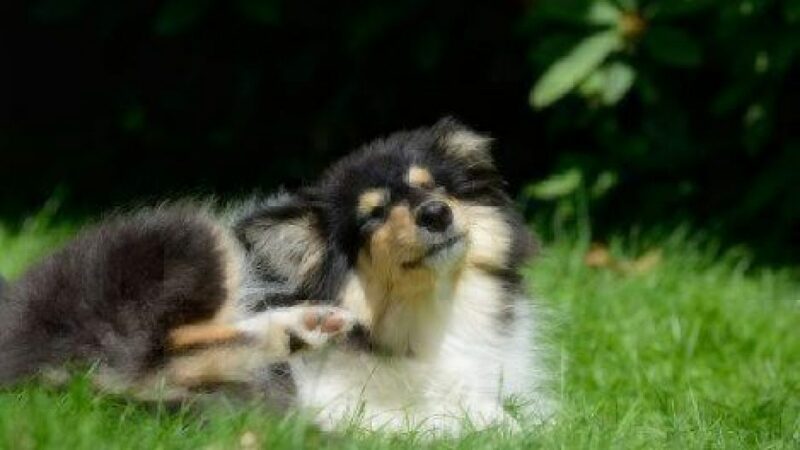 Itchy Skin – Dogs with itchy skin, also known as pruritus, are very common at the vet’s office, and the trouble doesn’t end with discomfort. The constant scratching can be fairly destructive and lead to lesions, infections, and hair loss. The source of itching can be anything from allergies to more serious diseases. Licking (“Acral Lick Granuloma”) – Many of you already know this skin condition: relentless licking of a single area (usually it’s that same spot on the leg too!). Usually caused by a wound, the dog licking leads to its lack of healing, which leads to further complications. It’s an endless cycle that can be stopped with a taste-aversion balm or even a collar. Mange – Mange is a skin disorder caused by mites. There are two types of mange: sarcoptic mange, also known as canine scabies, spreads easily and is noticeable through itching, red skin, sores, and hair loss; demodectic mange can cause bald spots, scabbing, and sores, but it is not contagious. Ringworm – Caused by a fungus, ringworm can be found on your dog’s head, paws, ears, and forelegs. It ranges from full lesions to inflammation and scaly patches and can actually spread to humans. Seborrhea – Seborrhea is the more formal name for oily skin that leads to dandruff in dogs. It can be genetic or it could be triggered by allergies or an unbalance in hormones. Skin Tumors and Skin Cancer – If you feel any out-of-the-ordinary lumps or bumps, see your vet as soon as possible to determine if the lump needs addressing. Consider looking into the melanoma vaccine; there are a variety of skin cancers that your pup can get and protecting your dog from skin cancer can be as easy as getting a simple shot. Sores and Hot Spots – Basically, any irritated areas on your dog’s skin he or she starts to scratch or lick is called a hot spot (aka “acute moist dermatitis”). They can be caused by allergic reactions, insect, mite, or flea bites, poor grooming, underlying ear or skin infections, and constant licking and chewing prompted by stress or boredom. If you spot any red, sticky sores, on your dog, get him evaluated before it worsens. Yeast Infection – Occurring mainly in the ears or on the paws, yeast infections are easy to diagnose and quick to respond to treatment. Symptoms include irritated and itchy skin that your dog can’t seem to stop scratching or licking. Your vet can help treat most any infection, but avoiding it can be tricky. Good nutrition and keeping your pet’s spaces clean and tidy are the first steps to preventing skin conditions. Thanks to significant advances in veterinary medicine, vets are now able to pinpoint exact causes of skin conditions in dogs and prescribe appropriate medication or changes in diet/environment to address a variety of skin conditions. Skin conditions have historically been treated with steroids, antibiotics, special shampoos, or dietary changes. Today, exact causes can be pinpointed and adequate medicines prescribed to help cure itchy skin that can come from a variety of sources. Atopica (helps alleviate skin conditions by working on your pet’s immune system): For a medium to large dog, it is approximately $2.50 per pill and the dose varies for each pet. You can expect a single daily dose for 30 days before tapering off to every other day ($75), then twice a week for an undetermined amount of time ($20/week until vet approval). For reference, vet bills can register up to $2,400 for venomous insect stings and snakebites, whereas a regular dermatitis treatment can be anywhere from $100 to $500 with full prescriptive treatments.Learn more about how the Healthy Paws dog insurance plan pays on your actual veterinary bill and covers injuries, illnesses, emergencies, genetic conditions, and much more. Download the Cost of Pet Care Report for more information on the treatments available, and what you can expect to pay if your pup develops a skin condition.